Salumi Artisan Cured Meats is located in Pioneer Square on the southern end of downtown Seattle. The salumeria was founded by Armandino and Marilyn Balali. After retiring from Boeing and two years of formal study in meat curing, Armandino and his wife opened what is today, a staple of Seattle’s food scene. 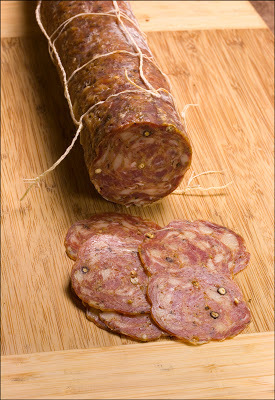 Salumi Tuscan Finocchiona is a treat of epic proportions. The meat is slightly dry yet rich, firm and studded with peppercorns, cracked fennel seed and a pinch of curry. Enjoy this salumi sliced paper thin, allowing the true flavors to unravel on the palate. When the meat hits your taste buds, the fat melts into salty aged perfection. 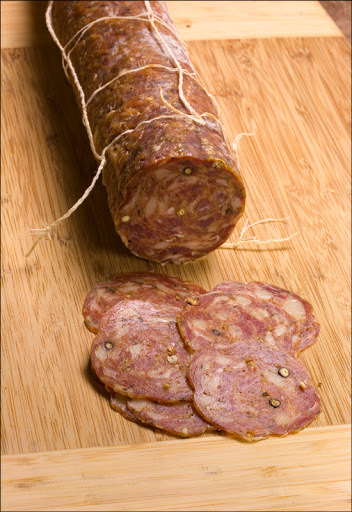 This salami will blow your mind and at $25+ per pound, it’ll blow your budget too. Order it freshly cut from Metropolitan Market, Delaurenti or straight from the source, Salumi.